As a citizen science project, Mark2Cure has been very fortunate to recruit a number of volunpeers who have grown to become experts at the concept recognition task and provide a lot of useful feedback, comments, and suggestions. While we encourage you to explore and use the site in the ways that work best for you, we would like to share some of the great tips that users have shared with us. Without further ado, here is our first user pro-tip. Upon the completion of a doc, you will be presented with a feedback screen which shows what your partner has marked, and the option to visit the talk page for that doc. The talk page button is right next to the ‘Next Doc’ button on the feedback screen. If there was anything in the document that you felt was confusing or unclear (in terms of whether or not it should be marked), someone else probably felt the same way you did. If you click on ‘Yes, Let’s Talk’, you may find that your question has been asked and learn from the answer; or you can post your question there so that others will learn from your question. If you’re worried that your question has been asked elsewhere, DON’T worry about that! Each talk page is viewable only by users who have contributed to that doc. This means that duplicate questions are welcome as they increase the likelihood new users will encounter them. On the talk page itself, there are several ways to check your work. Comments and questions submitted by users may have very useful info! 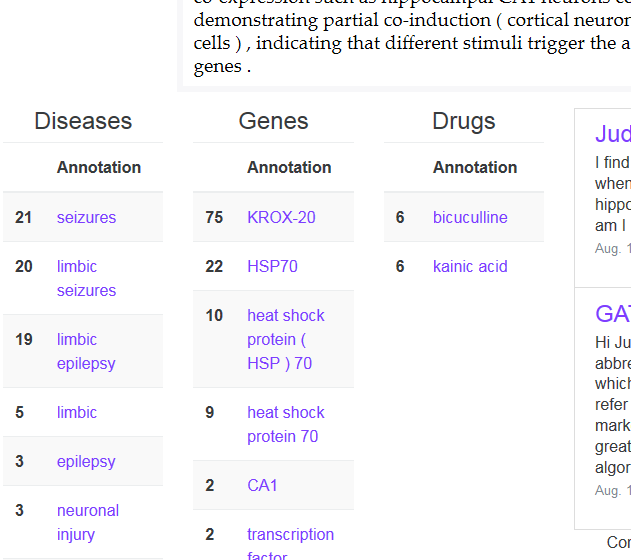 As seen here, this user has offered some very useful background information about some terms in the text. Secondly, you can see how other users marked this doc and learn off them by scrolling over the numbers at the top of the talk page. Different users may mark different terms in the text. Pay special attention to terms marked the same way by multiple users. 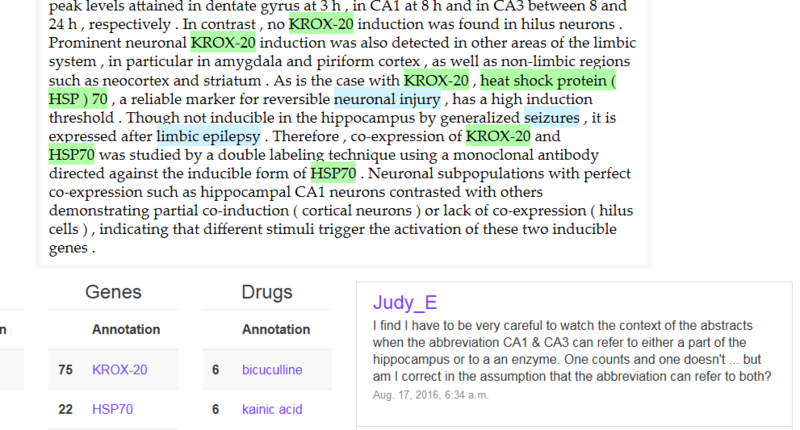 By looking at how other users marked the doc, you can get an idea on what annotations the community agrees should be marked. If you dislike scrolling through the user annotations, you can also get a feel for what the community marked by looking at the frequency table below. The table exhibits the top 20-25 most frequently marked terms for each concept type. The frequency table gives you a quick way to see the terms that were marked by people who have also completed this doc. Lastly, if you’re wondering why the majority of users marked something differently than you did, or if you just have doubts about what you’re doing, you are welcome to post about it! We will always try to respond in a timely fashion, but an amazing Mark2Curator may just beat us to it! If you’d like to chime in on a discussion about a document you’ve contributed to before, click on the ‘Talk’ link at the top right corner of your dashboard header. This will show you the docs that you’ve done which are under discussion. If a doc you’ve done doesn’t appear, it’s likely because no one has discussed the doc. If another users begins a discussion on a doc that you’ve completed, it will appear in your list. Special thanks to ckrypton for responding faster than I do on some of these, and for giving us the idea of this pro-tip!